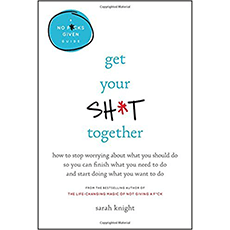 “Get Your Sh,t Together” is the followup to Sarah Knight’s “The Life-Changing Magic of Not Giving a F,ck” about mental decluttering. This book aims to take you one step further in organizing the f,cks you care about, and overcoming bullsh,t self-sabotage, to achieve sustainable happiness. - But (thing I want to do) is too hard! - Frailty, thy name is distraction! - Wish you were here! - But what if it doesn’t get done to my standards? - Want to make big life changes? Look at the small picture. - I know you are but what am I?